Maddow Breaks Down During Migrant Story [VIDEO] - Joe.My.God. 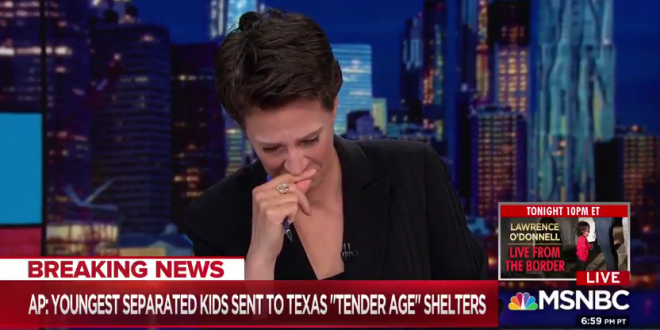 MSNBC’s Rachel Maddow broke down in tears on-air over a report about the Trump administration operating “tender age” shelters for migrant babies and toddlers. Maddow choked up while reading the first lines of the Associated Press’ report on the three facilities where children under the age of 13 are being sent after being separated from their parents at the border. She was unable to read the description of the shelters, first asking a producer to display a graphic, and then deciding to abruptly end her segment. “I think I’m going to have to hand this off, sorry,” the MSNBC host said through tears. Maddow apologized later in a Twitter thread, and shared the story again. If nothing else, it is my job to actually be able to speak while I’m on TV.